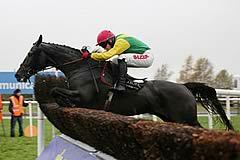 Placed behind the mighty Douvan on no fewer than seven previous occasions, Sizing John, formerly trained by Henry de Bromhead, claimed his first win since joining Jessica Harrington in last month's Kinloch Brae Chase at Thurles. Sent off at 100/30 for what was his first appearance over three miles, Sizing John travelled powerfully as Road To Riches and the sweet travelling Don Poli set a searching pace in the three mile Grade One in which Minella Rocco was an early casualty. None of the remainder could be ruled out turning for home and More Of That, a stablemate of Minella Rocco, and Empire Of Dirt both appeared to be travelling strongly on the heels of the principals. Sizing John was also travelling ominously well and he hit the front with a huge leap at the final fence before his stamina was given a thorough examination as Don Poli and stable companion Empire Of Dirt attempted to bridge the gap, but Sizing John galloped all the way to the line to prevail by three-quarters of a length. Empire Of Dirt narrowly beat 9/4 favourite Don Poli to the runner-up spot, with Carlingford Lough, winner of the last two renewals only fourth. More Of That completed a frustrating day for trainer Jonjo O'Neill when falling close home. Sky Bet cut the winner to 10/1 from 20s for the Timico Cheltenham Gold Cup while he is 5/1 with the same firm for the Ryanair Chase. The online bookmaker's Racing PR Manager Michael Shinners said: "Sizing John had already put down a serious marker for the Ryanair Chase and today he's given connections a dilemma as to whether to go for the Timico Cheltenham Gold Cup at Cheltenham. "He travelled well through today's race and didn't look like stopping so it would be no surprise to see them go for Gold and at least he won't have to meet Douvan there!" Harrington said: "He was brilliant. "It's fantastic to have a horse like that for Alan and Ann (Potts, owners), who has finished so close to Douvan on may occasions. That was his first time over three miles and he jumped, travelled and did everything we had hoped he would. "He jumped really well and he was just brilliant. Once he went past two and a half miles we knew he was into unknown territory, but we fully expected he would stay three miles and he did. "Whether he will stay three miles two and a half furlongs at Cheltenham (in the Gold Cup) is another question and I'll have to speak to Alan and Ann about it, but on good ground there's a chance he will." Power, who had rushed back from injury to ride the winner, having ruptured a disk in his back at Gowran Park on January 26, added: "We were in a good position as we hadn't gone quick and I always think that when you don't go quick, the first one to commit is in the best position. "I think he will have learnt a lot from this race today. He'll have learnt to relax a bit better and I've thought, from the first day I rode him here at Christmas, that he stays well. He galloped the whole way to the line."